Kelly Lehr Showing off their championship T-shirts from Boulder City Parks and Recreation Department's co-ed softball league on Sunday, Dec. 2, are members of TQ Pallets, back row, from left, James Jensen, Coral Leon, Ryan McQuillan, Angel Ragone, Therese Jovanov, Melissa Flores, Jared Bohanan, front row, from left, Taylor Barton, Randy Stover and Adam Robers. TQ Pallets upset the defending champions Sunday, Dec. 2, to win Boulder City Parks and Recreation Department’s fall adult coed softball league. TQ Pallets won 19-17 against Boulder Dam Credit Union during the championship game at Hemenway Valley Park. 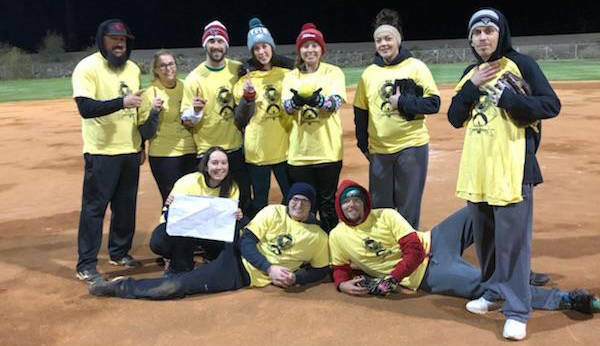 Boulder Dam Credit Union had defeated TQ Pallets early in the tournament, but it came back through the loser’s bracket to win the championship game, said Kelly Lehr, sports coordinator for the department. Since both teams lost only one game, the teams played the “if” game to decide the winner. A grand slam from Ryan McQuillan in the sixth inning brought TQ Pallets back into the game from an early deficit. Hits from Taylor Barton, Adam Roberts and Coral Leon cinched the win in the seventh inning, as Boulder Dam Credit Union could not score during its final at-bat, she said. The spring league will begin in early April. The parks and recreation department will start its adult mens basketball league Jan. 3. Kickball will start in February.